I thought I would check into World of Warcraft and see how the new leveling is, with the new scaling in areas. You don't need a sub to play characters under 20, so it was easy enough to pop in and start up another little alt. All in all it really wasn't bad, then again I don't mind scaling levels. I love them in SWTOR, in my mind makes older areas useful and fun again. I do rather like how EQ2 and Rift do mentoring and scaling, this version is auto-mentoring and over a certain level it just doesn't work. You can't go back and mentor down with a friend, which is something I have always hoped for, at least at max level you can't. After trying things out seeing how it worked. It doesn't feel that slow, the xp from quests is where you get the bulk of xp it seems and instead of one shotting mobs, mostly it only took three shots. Will it slow things down a bit? Yeah, but I don't think it's the worst change ever, it gives more options of what to do while leveling, places to go, or just stay around and finish things. Leveling in WoW has never been super hard, and it isn't hard now. I could change my mind after trying characters in other level brackets, but I hardly see things being that much harder compared to Vanilla, and I even thought that was easy compared to EverQuest back then. It is a bit jarring of a change after so long, so many years, for some people, so I do get that part. I'm not really for or against it. Dire has been playing WoW for a few months again. 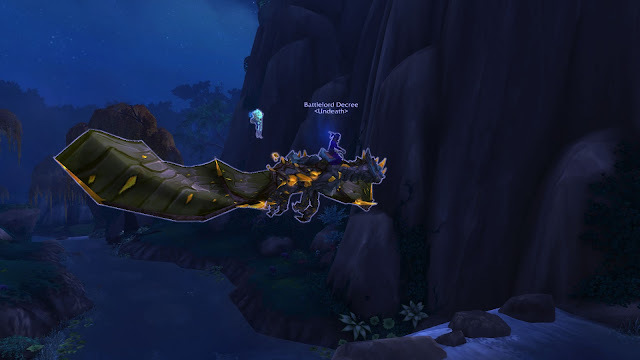 I kind of missed having something we were playing together, or at least the same game, so I decided to finish my flying on my main and just stop procrastinating. At first it really did grind on my nerves, completing all those must have objectives, like the Good Samaritan achievement. Actually doing dungeons, and... a raid. 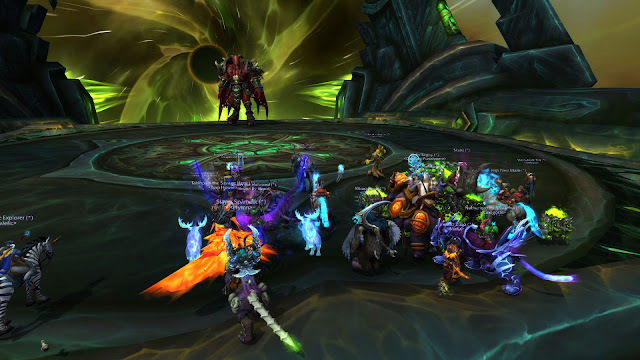 The dungeons and raid were easy enough to jump into with the group finder and I found I really wasn't having as bad a time as I thought I would of. I was completing objectives, with so much to do, so much ahead of me. 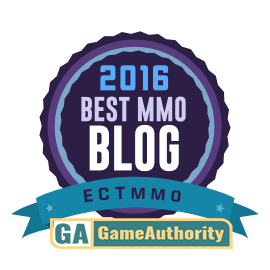 A lot of open world content with a smattering of instances to break up the monotony. 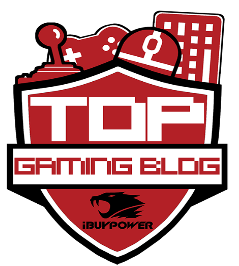 It's a change from a lot of the other games I am playing, there is just so much to do, so many different things to go after. I find myself back in the saddle, well, almost. I still have to finish off one faction, half way there, and then I will be flying around again. If I had a choice of not having to do flying quest/achievements, I honestly would prefer to not have them, it is always nice to jump into a game like EQ2 and now have to worry about it every expansion. It is good to be back, good to be playing the same game as Dire and it is good to be playing a game with just so much to do. I think I'll stick around for awhile. I am playing my lock mostly but once I open up flying I am sure it will give me incentive to do more on my alts. Oh and lower levels have more options for transmog! 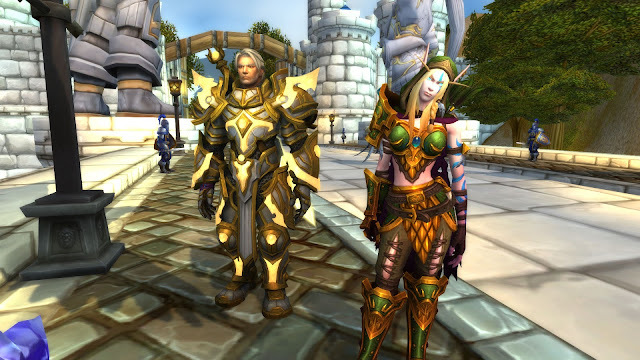 Another neat tidbit I noticed, the Argus story line introduced Turalyon and Alleria. 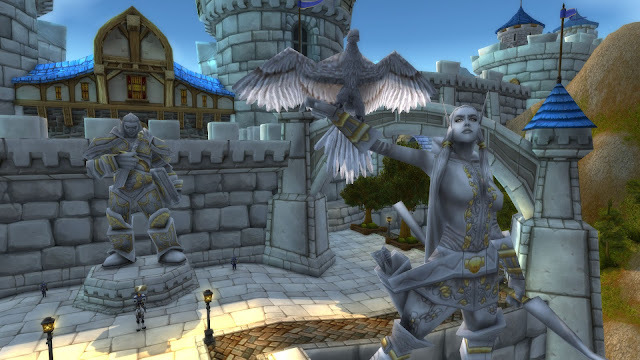 If you have played the game long enough you may have wondered who are those statues of, the ones outside of Stormwind. I had read up on some lore years ago, that they were missing, I had always hoped to see their story unfold one day and here it is. 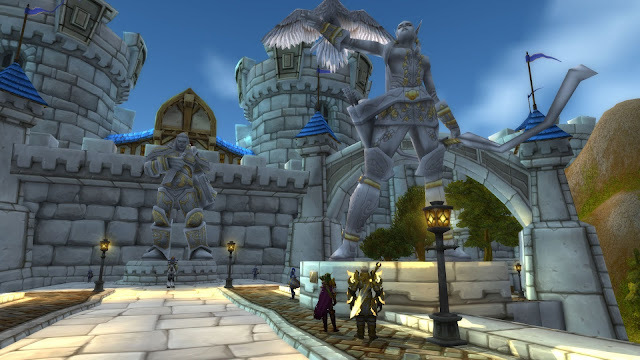 You even see them outside Stormwind, on a whim I flew out there to look at the statues for a screenshot and I found them looking at their statues, they also have a little bit of conversation to go check out as well. This was a really cool surprise. And if you don't know who they are, here is a neat video telling a bit about the pair. I also jumped in to Age of Conan to make a character on their new saga server. Vanilla/Progression/Saga type servers are all the rage now it seems. Rift has one coming out this spring, except you won't be able to keep your characters, it seems as of now, and could change. But with AoC you do get to keep your character once this server ends they will go to Crom, which I think is the better option. MMO players get attached to characters, letting them keep them after an event server is a really good choice to entice players. 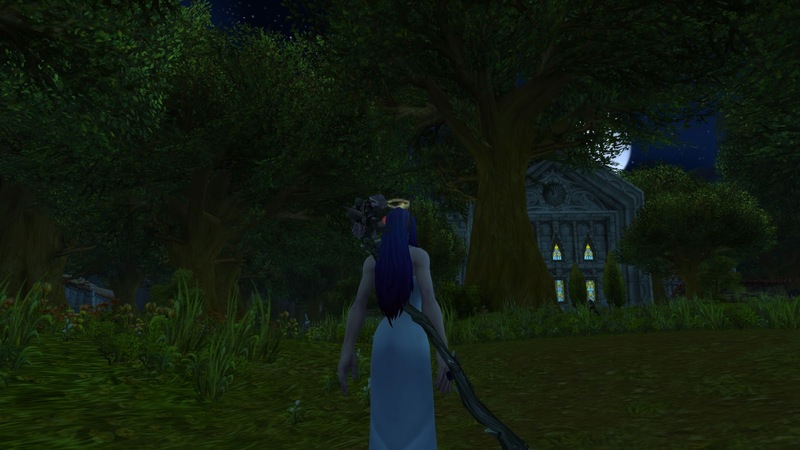 MMO players like persistent characters and worlds, they invest into characters. Memories are attached to these characters, even if we don't play them, we still like to keep them. 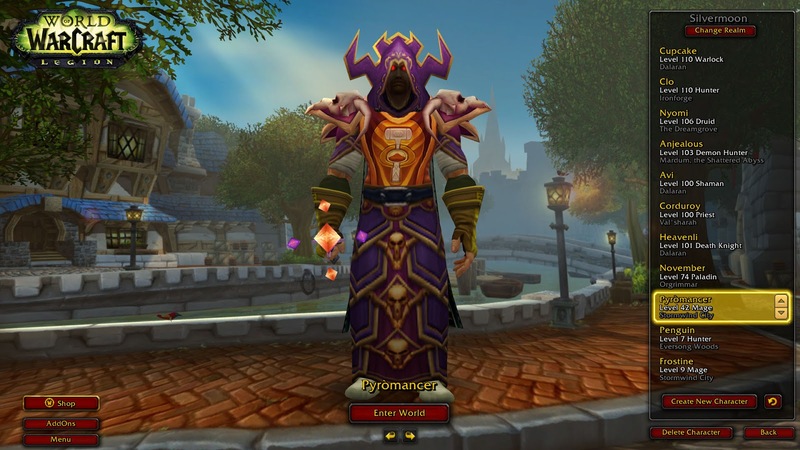 I still have my son's first WoW character taking up a slot, which isn't bad with connected realms, I use another server for other characters too. He was just a kid and has his own account now, but it's sentimental, I'll never delete him. I remember him playing this character with his friend next door, how excited he was, how much he loved his character, how cool he thought it was. Getting back on track, I am interested in participating in AoC but I have a lot going on IRL with a move in a few days. New house! Lots to do, so I will see what I can get done. AoC is always fun to play through Tortage at least. You also don't need a sub to play here, unlike most other types of these servers, which I was surprised to see. The price has also gone down for a sub, there are a couple of rewards now if you sub, a pet and mount, they look pretty nifty. Welp, I need to get back to packing, more posts in the next week or two! Have a great weekend! Turalyon and Alleria checking out their statues. Very neat moment, if you're even a little bit into lore in WoW. LFR, pretty painless these days. Dire helping me with some annoying quests. I really need to read up on this new leveling system in WoW. Being a bit OCD I like zones having quests and mobs with certain level ranges. That said, I certainly understand the benefit of leveling scaling because it doesn't restrict you necessarily to one area and you won't out level an area too fast. The last time I did play WoW, leveling was pretty dang quick and it was really easy to out level content. After playing so much WoW for years, I've found it really hard to get back into the game. I actually feel kind of overwhelmed when I think about jumping back in. The new leveling system actually has me interested in playing again because there is a ton of content that I haven played, which is why I feel overwhelmed! It is easier sticking to quest lines now, but the xp rate is slower. It isn't bad though if you want to get back into it and focus on questing, now you can feel like you have time to finish things you out leveled int he past!